Zed Seselja, Federal Senator for the ACT and Assistant Minister for Social Services and Multicultural Affairs, has toured the Chabad run Jewish community centres in Canberra. Chabad ACT Treasurer Theo Menachemson, Rabbi Shmueli Feldman, Senator Zed Seselja, Chabad ACT Reverend Shmuel Kiel. Senator Seselja shared lunch with the children and staff of Canberra’s Gan Yisroel Childcare Centre, the only Jewish preschool and child care centre in Canberra. Following the preschool tour, the senator was showed through the many services that Chabad provides to the Canberra community including the food bank, clothes bank, Kosher shop and Synagogue. In appreciation of the senator’s support for the community, he was presented with a framed picture of himself witnessing the completion of the inaugural Torah in Parliament House recently. 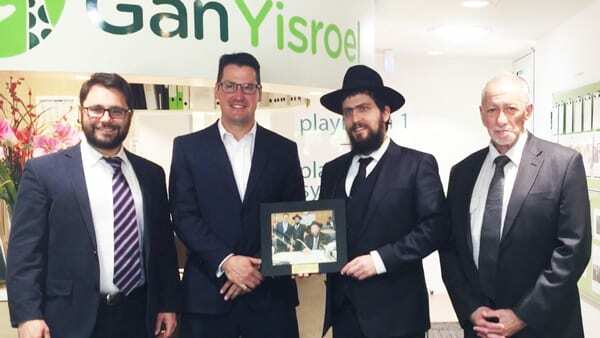 Senator Seselja said he was impressed with “seeing such a truly vibrant multicultural centre and how grateful he was for the work that Chabad ACT , le d by Rabbi Shmueli Feldman, does for the community”. I congratulate Zed on his performance as Assistant Minister for Social Services and Multicultural Affairs and his zeal in the way he adresses his responsibilities within this ministry and to the Canberra community.